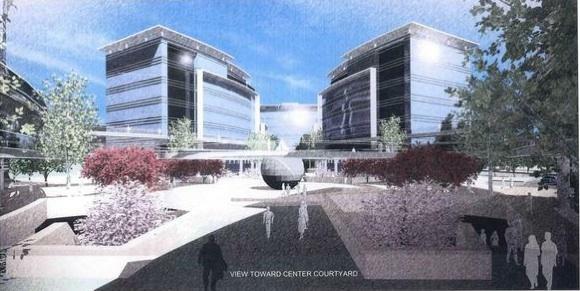 The mother of all proposed office projects in San Jose is getting closer to breaking ground. The latest plans that developer Peery-Arrillaga submitted to the city would involved building out the entire complex in a single 24 month phase. The epic development project would take up 31 acres with up to 10 buildings connected with elevated walkways. The plan calls for two levels of underground parking and surprisingly the cafe, pool, basketball courts, and volleyball courts would also be beneath the ground. Total parking clocks in at 7,103 spaces with entrances on Brokaw Road, Bering Drive (4 entrances) and Crane Court. The rumor is that there is already a tenant for the development, likely a Fortune 500 company such as Google, Microsoft, or Apple. It will be very interesting to see how this develops! Is there any provision for shopping or restaurants? if not it doesn't look very encouraging or the type of development sj needs. look at moffett towers development for a good example of bad planning. lots of buildings but its a total food and shopping desert. Actually this is great. It will be the biggest office complex closest to downtown. Very quick light rail ride (oxymoron?) up N 1st St - and very quick back home to one of 4 residential towers going in at the same time. Commercial Retail/Restaurants downtown Rejoice! This is massive (both literally and figuratively) for San Jose although I wouldn't hold my breath for any major flow-on for restaurants and/or shopping. If it truly is a company like Google, Microsoft or Apple, they will probably have on-site cafe's etc. Have you ever seen much flow-on from the Cisco buildings along Tasman? It's pretty dull even at lunch time. The flow-on will be for VTA light rail IMO...downtown in one direction and all those new (and very expensive) apartments further north around Tasman & River Oaks areas. Anyways, an exciting project if it pans out. Bit by bit they can develop North 1st street to it's full potential. Seriously.. been lately to Googleplex? It's a never-ending "remodel" and they're running out of space - faster than yesterday. Not much left but the swamp..
i am guessing Tesla motors since they are growing at a very fast pace and their current HQ in stanford research park must be ridiculously expensive. This will also bring them closer to the ex-NUMMI facility that they bought a few years ago. Ebay could be consolidating their charcot, hamilton, ave and brisbane locations into one. An even interesting one could be amazon wherein they have their one foot firmly in microsoft's backyard and the other in silicon valley. I think it would be a big boost for San Jose's economy if this project gets built with a major tech firm as an anchor. I'll be rooting for that to happen. But I think it's wishful thinking that Google will be the main tenant (or possibly move their HQ here). Google has been on a huge land-buying binge in Mountain View, Palo Alto and Sunnyvale recently, and all signs point to them becoming more ingrained in those cities, not less. While their existing buildings are pretty full, they have SO much opportunity to intensify their use near the Googleplex by building taller. Even if they go to just 4 or 5 stories, that's 4 to 5 times as much space as they have now since most of their buildings are 1 story. Excellent point. And the same logic applies for Apple and Cupertino. But like you (and probably many others) I'm rooting for this project! It's a stunningly large amount of space and the fact that it's being proposed as a single phase is intriguing.